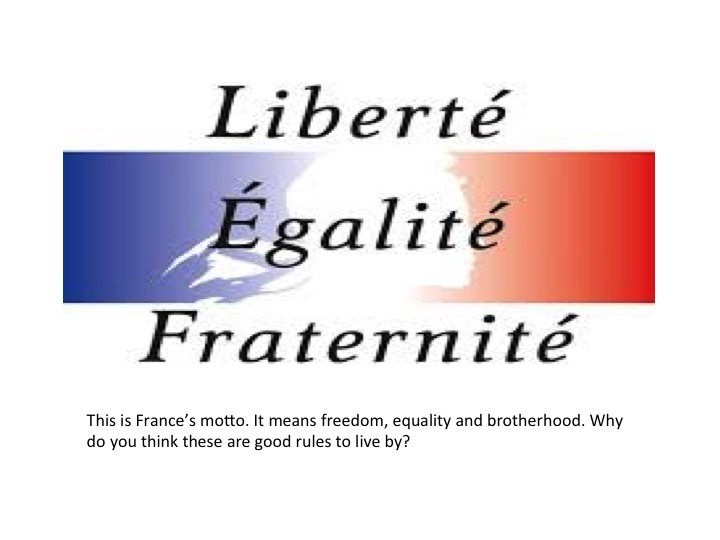 Thought for the Week: Liberte, Egalite, Fraternite. Freedom means when no one boss you about and you can do what you like. Fraternite’ means friendship and you might have to share your games with other people. I think that it means that everybody should have the same rights and that we should be treated the same. Friendship means when your being tolirent and sharing. I think Liberty means freedom. It means your allowed to do what ever you want.e.g If I was grounded and I wasn’t allowed to do anything I wouldn’t have freedom. Friendship means tolirence and shearing. Liberty means freedom and for example if innocent people go to prison for nothing and their telling the truth but one off them believe that person is free by the one who let him free it is bit like freedom. Dr.king tells a great speech and it is a true fing or we wouldn’t have any friends . Freedom is when your not forced to do something. You to any thing.friendship means when your kind to someone and your friends with them. France is a family and that they should always be there for each other. I think it means family ,equality and freedom . I think it is their motto because all of these word represent a strong thing that will help them in the future.Also they are good rules to live by because they help you and the words that they chose for the motto represents a thing that can help you in any situation.